The purpose of this cosmetic surgery is enhance and create more shapely lower legs. Calf implants are not just for cosmetic enhancement, but are also used in the correction of injury or muscle deformities. Calf implants are used in the treatment of diseases such as Polio, Spina Bifida or a Clubfoot, where calf muscle wastage has occurred in either one or both legs. Many women now are choosing to have calf implants to enhance and create more shapely lower legs. Calf implants can create definition in women where as men usually have calf implants to create bulk. The calf implants are like breast implants. Almost the same but shape where the shape is designed to enhance the lower leg contour. They are soft but firm and once inserted they can feel like the legs of well-exercised and developed calf muscles. Body builders will often request the biggest; this may not be the best, as each patient will have individual requirements. Symmetry and balance with the overall body is a very important factor when evaluating the patient. You need to be measured and sized appropriately by Dr Karacaoglu prior to surgery. During your consultation your surgeon will ask you about your wishes and desires for the outcome of your surgery. Wants to increase the attractiveness of the calf contour. Calf implants can be performed as day surgery. A general anaesthetic is normally the choice of anaesthetic. You may wish to consult with Dr Karacaoglu if you prefer local anaesthesia with sedation. If your surgery is for correction of a deformity or injury, you may wish to stay in hospital. Some of the private health insurance companies might cover this procedure if it is not deemed “cosmetic”. Prior to the procedure Dr Karacaoglu will draw all over your legs as in previous consultations. This is to ensure final measurements and positioning of the implant/s. A small incision is made at the back of the knee (in the posterior popliteal crease). 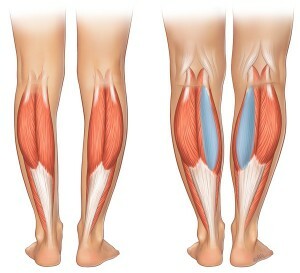 The underlying tissue is raised under the existing muscle and the implants are placed under the existing calf muscle (Gastrocnemius muscle). Under endoscopic vision which is pioneered and described by Dr Karacaoglu an optimal pocket is created depends on the plan that Dr Karacaoglu determined before the surgery. Contour is focused to optimally achieved at that part of the surgery. Endoscopic camera gives a superior advantage to achieve the goals of correction of the leg problem. The procedure takes approximately one – two hours to perform. There will be internal stitches that are inlayers. Most surgeons use dissolvable stitches in this procedure to ensure that the final result will eventuate in a fine scar. When you wake from the surgery you will be in compression stockings. You will be laying semi upright and your legs will be elevated higher than your body. This is very important to aid in reducing the post-operative swelling. Drain tubes may be present and will be removed within hours after surgery. In some cases tissue expanders are required temporarily to allow for gradual stretching of the skin and tissue. They are removed after several weeks and replaced with the implants. If the degree of enlargement is not excessive (in most general cases), permanent implants are inserted immediately in the initial procedure. Usually a 2.5 – 4cm incision is made at the back of the knee in the creases just below the knee joint (posterior popliteal crease). You will require a companion to assist in transporting you home. It is important not to wear totally flat shoes as this can put pressure on the calf muscles and increase your pain and discomfort. You will be wearing compression stockings that will be required to be worn for up to four weeks, as discussed with Dr Karacaoglu. Most people describe the pain as being “stiff and sore” similar to a strained muscle. Dr Karacaoglu will assist with any discomfort with prescribing oral pain medication. Antibiotics may also be prescribed to decrease the risk of infection. On arriving home from the surgery you must sit or lie with your legs elevated higher than your body. “Bed rest” for two to three days may be required. You are, however, able to go to the bathroom and shower normally, albeit briefly. You must follow Dr Karacaoglu’s instructions regarding bed rest and elevation of your legs. The reasons are that movement can increase the risk of infection and bleeding. The implants may shift if too much exertion is placed on the lower legs. It will also increase your pain levels. It is important to keep the wounds clean to prevent any contamination and risk of infection. Support tape may be applied to the suture lines; the sutures will dissolve over time, usually around three weeks post-surgery. If your work is not physical, you will require one week off. If your work entails physical or strenuous labour, you may require three weeks off. It is important to avoid the climbing of stairs initially. The compression stockings may be required for up to four weeks. Normal strenuous exercise can be resumed at six weeks. This is to ensure that the implants are securely positioned. Remember that surgery is not an exact science. Your own body can change the course of healing. You may even require adjustment surgery. Never look at cosmetic as a completely risk free venture. Research your options and become well informed. Dr Ercan Karacaoglu will discuss the most common associated risks.